I'm done. Yes, the snow is lovely, I'm sure. I can't tell you right now, because I can't even look out my windows anymore. I'm done! Even people in town from Wisconsin are saying it's awful out there. I'm burying my head in a blanket and I refuse to come out until it's above freezing again and I know that if I need to leave my house, I can. Then, I'll be sane again. I think. I can identify with your graph. I have seen some form of snow on my property every single day since 12/26/10 why won't it go away and stay away. I never thought I'd come to despise the color white so much. Hmmm...I want to feel sorry for you but I'm struggling. You see, I live in NorthEast Ohio where we have doctors who actually specialize in seasonal disorders, regularly prescribe vitamin D (since we're pretty much all deficient), and regularly treat snow shoveling injuries and snow blower injuries... not to mention all snow/ice related accidents. LOL Right now, we are all stuck on #4 of your chart and regular conversation includes the phrase "move South." Don't worry, it'll be over for you soon! Have you seen recipes for snow cream? yum! You just need to move further south in Texas. We have had a lovely morning of sledding and snowmen in Aggieland. We will be 55 degrees tomorrow. I love snow for the day! If you have a bark spreader--plastic shovel with flat front edge--that will do for a snow shovel in a pinch. It took me twelve years for my brain to become "numb" to the snow and cold. I couldn't believe I didn't faint from being overwhelmed when our weather gal said it only DIDN'T snow 3 days in January! I'll be praying you warm up soon. You're right that it's because the south is so ill-prepared for this kind of weather. I can't imagine not having snow plows, salt trucks, shovels for every member of our family (we do, really! ), space heaters in every bedroom, and wool socks. Maybe I should send you some...wool socks. :) Hang in there. Totally laughed my bum off reading the post about the "salt truck" yesterday. You nailed it on the head. Bring on the warmth! My hubby says, "I never thought we'd have to live in that again!" Oh wait. That cartoon was serious. I'm sorry. I feel for you--literally. Charlotte-About the driving... I think people who live in the Northeast are insane when they drive. It would be a whole lot better if we all could just stay home. But I guess we can't do that. I do not drive in these conditions unless I have an emergency and leave it to the crazy men (who I think secretly LIKE to drive on the ice). When I was a teenager, we would drive to empty parking lots in bad weather and go fast and spin our cars around like idiots. 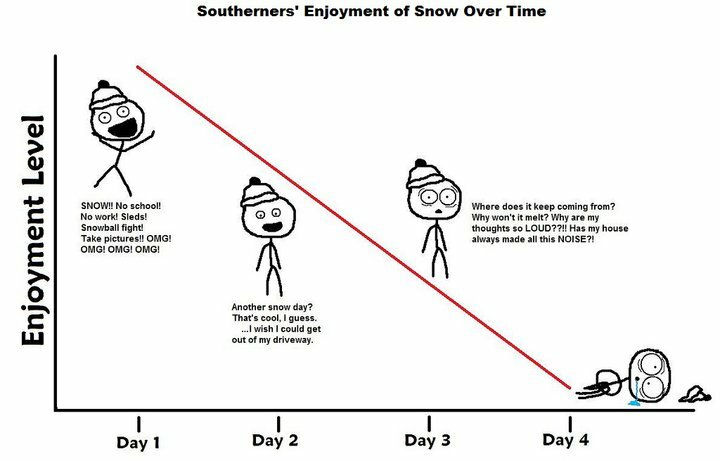 Snow does things to the brain... as your chart accurately depicts! We CAN go out when it snows-- because we have clothes for it. But, on the other hand, many people (us included) don't have AC, and when it gets above 85 for more than 1 day straight there's a "severe heat warning" and everyone walks around talking about how we're all going to die. I hope you get out soon! Ice is horrible, and I've heard that southern grocery stores don't get shipments in this weather! Yuck! Thankfully Deirdre, we shopped on Monday before the storm hit and don't need to replenish our food stores yet, but you are right...everything is shut down including grocery deliveries from what I understand. Wait a minute.. Did you get that from me? I know I posted it, but now I'm just confused. And I confess to liking winter better than summer. Where we live, you can always put on enough clothes to stay warm, but it's hard to take off enough clothes to stay cool during August! Um... I think a lot of people have posted this cute representation of our current weather insanity, but no, a friend from college, Roger D., was the first posting I saw. We were lucky here a bit farther south than you. It is very difficult when you can't get around. We went to mass this morning, but it was not a very good or easy drive. My suburban struggled to get started whenever we were at a stop sign. We didn't have any snow plows come clear the roads, the sun did that. One morning of this was enough. And, the A/C is much better than the heater. I can always cool down but it seems I can't ever get warm unless I sit under the shower. Things to like about being stuck in the house during a snowstorm: 1) sweaters. I have them in every color and theme. 2) throw blankets. I have them in every color and theme. 3) board games (also known as "bored games") and finding out who REALLY is the best Scrabble player because you've played so many times, you have enough scores for a fair assessment. 4) hot chocolate with breakfast, lunch and dinner. You can justify the calories because -- well it's snowing, for heaven's sake! 5) You will SOOOOO appreciate spring after this winter! :) Stay warm down there, Charlotte! Those of us who are more used to it really do sympathize with y'all who aren't.